The Pisces New Moon is a Total Solar Eclipse! It occurs on Tuesday, March 8th at 6:54 pm MST at 18 degrees Pisces 55 minutes. Here’s the chart: PiscesNewMoonSolarEclipse2016. The two fish that symbolize Pisces represent the processes of both involution or manifestation – Spirit descending into matter, and evolution or transcendence of the physical world of matter – ascending back into Spirit. Portrayed accurately, the two fish are always connected in some fashion. This connection reflects the universal truth that SPIRIT AND MATTER ARE ONE. Similarly, the symbol for Pisces, two opposite vertical curved lines with a horizontal line crossing them, also symbolizes this everlasting connection. In truth, there is no separation between Spirit and matter. Solar Eclipses are super powerful New Moons that ‘seed’ tremendous transformative energies. Eclipse energies accelerate evolutionary progression on planet Earth. These energies are always associated with the sign in which the New Moon Solar Eclipse occurs. Happening in Pisces, these ‘seeds’ will be reflected in issues ranging from the least evolved expression of Pisces like fraud, theft, disease, deceptions and delusions, to the highest expression of the sign through things like charity, humanitarianism, compassion and forgiveness which are associated with a philosophy of the universal sacredness and connectedness of all things. Evolved Pisces energy is ultimately expressed through spiritual development, awakening of consciousness and the transcendence of limited Earthly realities. Of course, as always, how this powerful Pisces energy actually manifests will depend upon how we choose to use it – both individually and collectively. Will we use it to deceive ourselves and others, obfuscating the truth, or will we use it to reach to a higher level and lift each other up? This Total Solar Eclipse will be visible from Southeast Asia eastward through the South Pacific Ocean to just North of the Hawaiian Islands. Those who live in the shadow path of a Solar Eclipse typically experience its energy and influence much more so than those who live elsewhere. 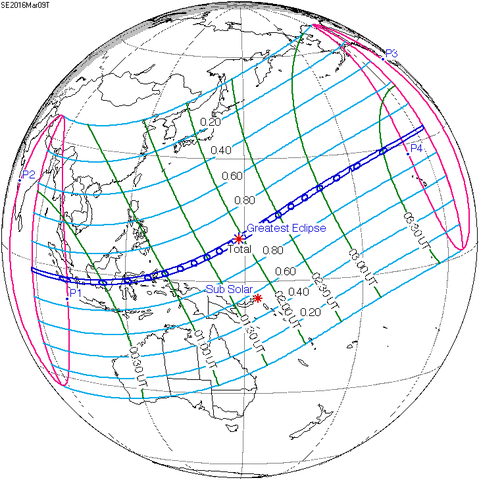 This Solar Eclipse energizes a path from Singapore through Indonesia and into the South Pacific. Therefore, we can expect headlines in the coming months highlighting significant events occurring in these parts of the world. Pisces is naturally wholistic in nature because it reflects the totality of both the manifest and unmanifested creation. Accordingly, Pisces reflects the entire zodiac as it contains all the twelve signs within it. As the final sign of the zodiac it’s also naturally associated with culmination. Pisces always brings things to their natural end. As the last sign of the natural year (correlating with the natural world or nature) Pisces coincides with March, the month that occurs just before the Sun enters Aries signaling the annual Spring Equinox and the beginning of a new year in the natural world. It’s fitting therefore that Pisces naturally calls for a withdrawal from worldly affairs in order to reflect upon and deeply contemplate the previous year’s experiences to distill the lessons learned and the wisdom gained. 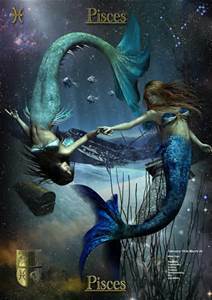 As the final sign of the natural zodiac, Pisces is also associated with the human process of spiritualization. In Pisces, the Soul’s desire to return to and reunite with the Divine Source that created it completes its evolutionary journey. To facilitate this ultimate Soul desire, Pisces dissolves any and all barriers preventing reunification with ALL THAT IS or the Divine Source, God, Goddess, Great Spirit or whatever it is that you perceive to be your Creator. As these barriers dissolve, we often experience a time of confusion and loss of meaning relative to all that we previously held dear and thought would bring us fulfillment. This dissolution process ALWAYS ultimately requires surrender. Some people interpret surrender as a loss of control or see it as a weakness and mightily resist relinquishing their personal will to their Divine Will. Nevertheless, surrender is indeed what’s required in order to learn the spiritual lessons associated with trusting something greater than our selves – a Higher Power. This truth is poignantly evident in the age old saying, “Let go and let God.” Ultimately, when the dissolution process is complete, we’re delivered to some new reality, miraculously transformed having transcended an old limited or unhealthy reality. This New Moon/Solar Eclipse (Sun and Moon) in Pisces is joined by Mercury (logic, information, communication), Neptune (dissolution that facilitates spiritual evolution), Ceres (losses and returns), Chiron (wounds and healing) and the Moon’s South Node (emotional body, self-image, the past). That’s a LOT of Pisces energy available to dissolve and transcend old realities that have reached their limits, are no longer serving us and are naturally culminating. With Ceres’ association with loss, Chiron’s association with wounds, and the South Node symbolizing things of the past that must be let go of in order to continue growing and evolving, there’s a powerful emphasis on releasing, finishing up, letting go, death, endings and completions in this New Moon pattern. Often, many Souls leave the planet during eclipses. Those who remain are likely to experience disappointment, confusion or a deep sense of loss as the old dissolves and gives way to the new. What’s lost meaning in your personal life? What’s dissolving, dissipating or disintegrating? Are you surrendering to this process or fighting it? What’s ending in your life now? What do you need to let go of so you can heal and continue to grow and evolve in new ways and in new directions? Neptune rules Pisces and is therefore the planetary ruler of this New Moon and Solar Eclipse. Neptune continues to comprise the foundation of a powerful ongoing Spiritual T-Square along with Saturn and Jupiter. This T-Square is reflecting and compelling a profound review of beliefs and belief systems, like faith traditions and political and religious ideologies. It’s urging us to reach for and to embrace higher levels of truth and understanding. What’s happening in your own life now that’s causing you to ponder or question long-held personal beliefs or what you’ve always thought was true? Keep in mind we also have MANY personal beliefs in addition to traditional religious beliefs. For example, many believe they’re not good enough or intelligent enough or that the bad things that have happened to them are punishment for their ‘sins.’ Perhaps you believe you’re unattractive or not worthy of love or that the world isn’t safe so you’re justified in always being afraid. Remember that consciousness creates reality and you can easily see the extraordinary evolutionary purpose and intention of the current Spiritual T-Square as well as the tremendous dissolutioning process now underway through so much Pisces emphasis. This review of beliefs is being facilitated through the increasing urgency of crises, personally and globally. From an evolutionary point of view, crises have a natural purpose. Crises alert us to that which is NOT in alignment with or rooted in REALITY. Crises further alert us to the need for serious changes and adjustments in order to resolve them. Using wide orbs (range of energetic influence), ALL the planets currently in Pisces are square Saturn in Sagittarius and opposite retrograde Jupiter and the North Node both in Virgo, greatly expanding the influence of this Spiritual T-Square over the coming weeks and months. Consequently, expect ongoing crises to intensify in magnitude and frequency and new crises to emerge because these crises are reflecting our stubborn resistance to making necessary changes and adjustments. Social, political and economic dysfunction continue to manifest through increasing disease outbreaks, contaminated water supplies, opioid addiction, greater frequency of extreme weather events and global scandals revealing rampant and widespread fraud and corruption. Fortunately, current celestial patterns are not only very auspicious for change, they seem to be demanding change! It’s a very opportune time to heal ourselves, our relationships with one another and our planet – IF WE CHOOSE TO DO SO. Indeed Pluto is THE planet associated with the evolutionary process itself which is always facilitated through FREE WILL CHOICES. All human beings are intrinsically powerful because we all have the capacity to make choices. Capricorn teaches self-responsibility. This sign also rules the structural nature of human consciousness. As we take more responsibility for the choices we make, we develop greater and greater levels of mastery relative to an evolving quality of consciousness. As our consciousness evolves we increasing make choices with deliberate and conscious intention, thus co-creating desired realities and outcomes, instead of unconsciously choosing, which unwittingly continues to manifest the same old undesired and troublesome experiences over and over and over again. 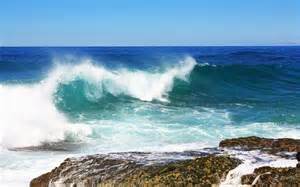 Many old wounds (Chiron) can be healed now, particularly those of a spiritual or psychological nature (Pisces). The present moment in time, symbolized by current planetary patterns, is utterly ripe for releasing (Ceres) the past (Pisces South Node) particularly elements of consciousness that identify with victimization (Neptune and Pisces). Victim consciousness is ALWAYS responsible for creating and maintaining wounds. 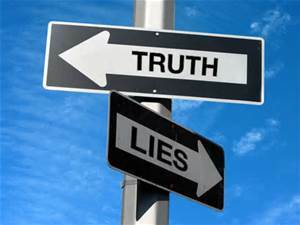 In order for effective culmination and subsequent healing to occur, the truth must be faced squarely. No more idealizing, fantasizing, self-deception or denial. Delusional thinking cannot and will not be effective. In fact, faulty interpretations of reality based upon distortions of truth will only serve to re-imprint and deepen the wounds. Water, drugs, pharmaceuticals and pharmacists, oil, gases, solvents, chemicals, paint, fraud, thieves, deception, delusion, illusion, fear, loss, imagination, art, imagery, photography, film, cameras, television, movies, actors and actresses, music and musicians, fantasies, toxins, infection, disease, poison, lymphatic and immune systems, feet, fish, navies, sailors, submarines, ships, boats, oceans, rivers, streams, lakes, wells, springs, consciousness, unconsciousness, subconscious, dreams, psychology, mental health, insanity, counseling, hospitals, institutions, prisons, seclusion, isolation, melancholy, depression, addiction, poets and poetry, prayer, meditation, charity, philanthropy, volunteers, non-profit organizations, transcendence, religion, spirituality, spirits, holy people, ministers, imams, rabbis, priests, divinity, sacredness. Take a moment now and reflect upon all the things happening across our planet and in your own life that are associated with things in the above list. Consider how some of them are expressing Pisces energies negatively, i.e., Flint Michigan’s lead poisoning of its water supply and the uncontrolled methane gas leak in Porter Ranch California. Consider also how some are expressing Pisces energy positively like body cameras for law enforcement officers and breakthroughs in cancer treatment through innovative immune system therapies and reduced prison sentences for non-violent drug offenses. Clearly, Pisces energy is manifesting everywhere! How are you choosing to use all this Pisces energy? Of course, these issues are not the ONLY issues in the news these days. But then, Neptune isn’t the only planet active right now in the heavens. We’re still feeling and experiencing the very powerful influence of the ongoing square aspect (90 degrees) between Uranus in Aries and Pluto in Capricorn. The r-evolutionary social, economic and political changes symbolized by these two transformative planets have been underway for the past five years and will continue for the next five years! 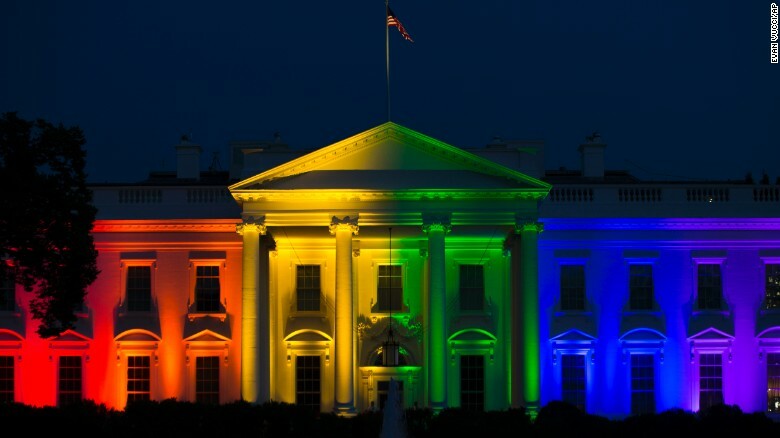 These changes began with the global economic collapse of 2008 and doubled down with the ‘Arab Spring.’ The effects of Uranus/Pluto have manifested in a myriad of ways including legalization of marriage equality, extraordinary advances in science and technology, an explosion of social media participation and increasing social unrest that continues to drive radical changes in establishment politics worldwide. And speaking of radical political changes, Uranus in Aries is exactly inconjunct retrograde Jupiter in Virgo now. The inconjunct aspect is a 150 degree angle associated with crises! Jupiter rules honesty and dishonesty and always greatly expands whatever it touches. Uranus rules politics, politicians and political parties. HUGE (pun intended) changes and adjustments are happening right now in the American political system as our Presidential campaign kicks into high gear here in the United States. Establishment elites in both parties are anxiously wringing their hands as old political paradigms have broken down and ‘conventional wisdom’ (an oxymoronic phrase if ever there was one) relative to political campaigning has proven to be utterly ineffective. 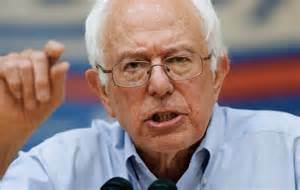 I’m totally fascinated with how the ONE presidential contender who seems to be speaking the most truth, Senator Bernie Sanders, is the one most ignored by the media! 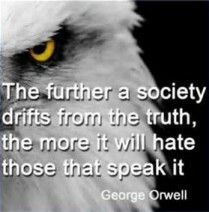 Reference once again the above graphic regarding societies that drift from the truth hating those who speak it! In the sign of Virgo, Jupiter is telling the truth, especially regarding matters pertaining to workers, jobs and the health and well-being of both people and the planet. Rejecting free trade agreements that kill jobs, expanding healthcare for all, transforming our energy system away from fossil fuels towards sustainable and renewable energy sources and opening our hearts and homes to assist desperate refugees fleeing war and starvation seems to me the right way to go. Considering that retrograde Jupiter is now opposite every single one of those Pisces planets, thinking universally (Pisces), with a philosophy or mindset that believes ‘we’re all connected’ and ‘we’re all in this together,’ is definitely the right way to go. Retrograde planets always accelerate our evolution. This occurs through experiences associated with the opposite sign. Retrograde Jupiter in Virgo points directly at Pisces and all of its universal one-ness and humanitarian compassion. Jupiter rules the right-brain which is the source of intuition. To evolve now, we must also learn to embrace and trust our intuitive faculties once again. In a world long conditioned to rely exclusively upon left-brained logical thinking and fact-based, empirical evidence, the denial of our intrinsic right-brained intuition is a denial of 50% of our brain capacity. This has resulted in extremes of imbalance in nearly every aspect of our lives from the weather, to income inequality to religious ‘extremism’ to overwhelming refugee migrations. As changes occur in the outer world, we must make necessary inner changes and adjustments to them. Our intuition will point us in the right direction so we must listen, Listen, LISTEN to those inner voices providing intuitive guidance! 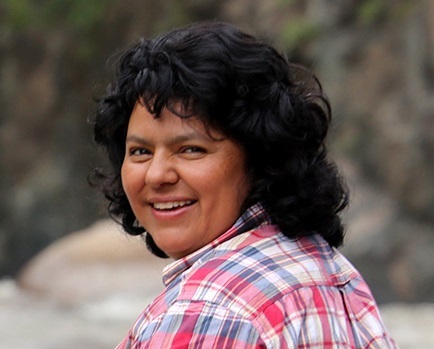 Berta Caceres stands at the Gualcarque River in the Rio Blanco region of western Honduras where she, and the people of Rio Blanco have maintained a two year struggle to halt construction on the Agua Zarca Hydroelectric project, that poses grave threats to local environment, river and indigenous Lenca people from the region. Virgo is the sign most associated with the environment. Restoring and healing the environment should be a top priority for all humanity now. Sadly, the world lost a passionate and courageous truth-teller this week. I wish to honor Berta Cecares, a long-time political activist and General Coordinator of the National Council of Popular and Indigenous Organizations of Honduras who was assassinated on March 2nd in her home. She gave her life to protect Mother Earth. Twelve environmental defenders were killed in Honduras in 2014, according to research by Global Witness, making Honduras one of the most dangerous countries in the world, relative to its size, for activists protecting forests and rivers. If we are to be successful in resolving our many crises, we must also once again embrace NATURAL LAWS. These are the laws that underpin the natural world and are self-evident in nature. Indigenous peoples have been the holders of ancient natural wisdom for centuries even as they have experienced egregious acts of persecution including genocide. It’s time to respect their knowledge, honor their wisdom, accept their leadership and listen to their concerns and advice about how to return to a way of living that is in harmony with the natural world, not at war with it. Finally and perhaps most fortunately, Pisces also rules the totality of consciousness which is why it’s associated with images, imagery and imagination. Consider the fact that before anything manifests into actual physical reality, it first exists as a thought in our minds. When we desire something, we begin to think about it, imagining what it would be like to have it or experience it. What I’ve just described is the process by which consciousness creates reality. It always begins with the power of the mind to imagine. It’s time to harness this power much more consciously, intentionally and deliberately. Some call this ‘intentional manifestation.’ Others refer to it simply as ‘conscious co-creation.’ Whatever you wish to call it, it’s POWERFUL! The abundant Pisces energy available to us all now is the perfect stuff to dream a new world into being. I encourage you, if you are called to do so, to invite like-minded friends to gather together to intentionally co-create desired changes you wish to manifest in the world. Use the extraordinary power of your mind, through your own free will choices, to consciously co-create what you want in your world and in our world. Just IMAGINE what you want, in as much detail as possible. What would it look like, smell like, sound like and feel like? Hold the precise image of it in your mind. 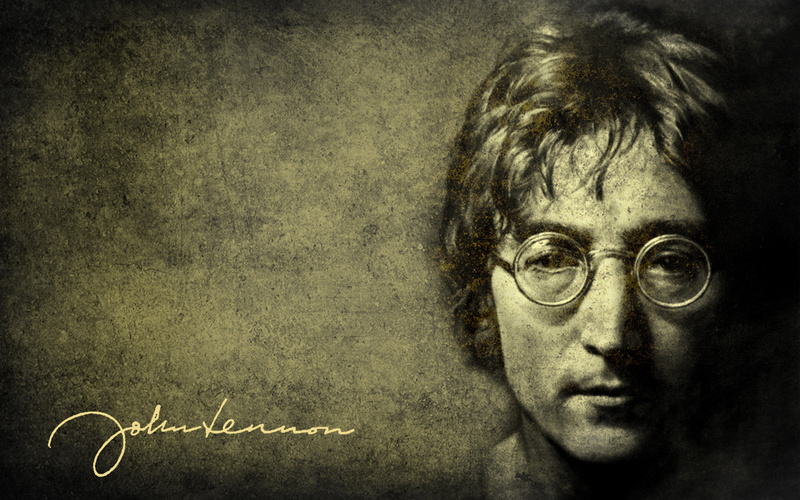 Imagine it as if it already exists and feel gratitude for its existence. Add in feelings and emotion and the power of manifestation is significantly magnified. Endowed with the power of consciousness and free will choice, we simply do not have to settle for old realities that are dysfunctional, unhealthy and unsatisfying! The Aries New Moon/Spring Equinox is on April 7th at 4:23 am MST. This entry was posted in Planetary Events and tagged compassion, consciousness, dishonesty, environment, forgiveness, free will choice, future, healing, health, honesty, intuition, Jupiter, new moon, ONE, past, Pisces, Pluto, power, Solar Eclipse, Spirit, Spiritual T-Square, truth, victim, Virgo. Bookmark the permalink.